The Roland DJ-808 is a four-channel controller for Serato DJ Pro that comes with an integrated 16-step drum sequencer loaded with sounds from iconic Roland drum machines: the 606, 707, 808, and 909. It’s the closest thing you’ll get to an integrated solution that combines “traditional” digital DJing with producing / step-sequencing. It’s well-built, capable, and ambitious – we love the courage behind creating a niche product like this, and the best part is that it’s a joy to use. If you think DJ controllers these days are just more of the same, you’ll want to check this out. Roland threw a curveball back with the introduction of the DJ-808. It made waves because of two things: first, it was Roland’s initial foray into creating DJ controllers (later to be followed by more compact models), and second because it had a hardware drum machine step-sequencer onboard. And not just any drum machine mind you – this is Roland we’re talking about, and if it’s got Roland DNA running through its veins, you know that the drum sounds are going to be legendary: the DJ-808 features sounds from the Roland TR-808, TR-909, TR-707, and TR-606 baked into the unit. Why all the fuss with these numbers? If you aren’t familiar, Roland created the first widely available electronic drum machine in the form of the Roland TR-808 back in 1980, and it’s the electronic drum sound heard on thousands of recordings and is still being used today. A vintage TR-808 goes on eBay for upwards of US$3000 a pop, so obviously it’s a well-loved sound. The DJ-808 is a four-channel DJ controller that’s got three-band EQs, trim pots and an FX knob per channel. It’s also got four volume faders and an assignable crossfader and a fader curve switch. It’s got two decks, and each deck has a jogwheel, eight performance pads, as well as an FX section. It also has four “Channel FX” buttons that let you pick what the FX knob does per channel. There’s a lot of connectivity behind the unit: it’s got a pair of XLR Master outputs, RCA Master jacks, 1/4″ Booth jacks, four pairs of RCA inputs with two of them being switchable line/phono jacks, a combo XLR Mic input with a volume knob, Midi Out for syncing with outboard gear, two USB jacks for connecting other Roland Aira hardware, a USB socket for connecting to your laptop, a power socket for the included wall wart and a power switch. Whew! In front of the unit are 1/4″ and 1/8″ headphone jacks, headphone volume and cue mix knobs, and a headphone mono split switch. You’ve also got lots of mixer customisation options in the form of crossfader assignment switches, crossfader curve and channel curve switches. At the top of the unit you’ve got the Roland TR-S step sequencer which lets you program drum sounds and samples on the fly. It lets you program drum patterns while you DJ, and can also be used to trigger Serato DJ Pro’s eight-slot sampler. Other controls include two jogwheels with green centre LED rings, 16 performance pads, and crossfader / channel curve switches, and input selection switches. It also has phono/line inputs, and is compatible with Serato DVS. The DJ-808 has the TR-S step sequencer onboard. It consists of 16 buttons which you use to program drum hits. The DJ-808 comes with four drum kits: 808, 909, 707, and 606. Each drum kit has four sounds: bass drum, snare drum, closed hi-hat, and open hi-hat. The way it works is you choose a drum kit by holding Shift and pressing the corresponding drum kit button. You then can choose a drum sound by pressing either BD (bass drum) SD (snare drum), CH (closed hi-hat), or OH (open hi-hat). Once selected, you can now press any of the sixteen step sequencer buttons to add that drum sound to the pattern. You can also use the performance pads to trigger these drum sounds and record them onto the TR-S sequencer. You can change the tempo of the pattern via a BPM knob, and you can adjust parameters of the drum sound such as Attack, Decay and tuning. There are also volume faders for all four drum sounds, which is useful for making rhythmic variations without having to mess with the patterns you’ve already made. The DJ-808 has a robust mic section that includes more than just level and EQ controls: it’s got a Pitch Shifter that lets you change the Pitch, Reverb and Formant of your voice. It includes an Auto Pitch feature that makes your voice a little bit sweeter by moving it closer to a standard musical note, handy if you like to sing live but you’re “all over the place” (like me, for example). It’s not foolproof by any means (don’t expect to turn into Sam Smith) but it’s fun if you need a hard auto tune similar to the vocal sound made popular by T-Pain and Cher. It may look complicated on paper, especially for beginners, but those familiar with programming drum machines will be right at home. That said, it isn’t that difficult to grasp once you’ve spent some time with the DJ-808. I DJed a house set and tried to use the TR-S sequencer on the fly (yes, without reading the manual or watching tutorials) and found that it was fairly easy to grasp. Roland has done a fantastic job of keeping things as simple as possible without watering down the step sequencing experience. DJ/producers will compare this to the Pioneer DJ Toraiz SP-16 sampler, or even the DJS-1000. Both units are powerful, but power here is a double-edged sword: all that under the hood muscle makes them rather complex affairs that can be challenging to use in the DJ booth. It’s here that the DJ-808 edges both of these Pioneer DJ devices out – it’s just so simple and straightforward that you’ll find yourself mixing in and out of drum patterns and fills that you make which, by the way, are excellent thanks to Roland’s careful sampling of their own legendary sounds. The DJ-808 jogwheels are thick and have a nice heft to them. They’re about the same size as what you’d find on a Pioneer DJ DDJ-RX controller. Though they get the job done and are decent for scratching, they are wholly unremarkable. There are eight pads per deck on the DJ-808, and there are eight performance pads functions here: Hot Cue, Roll, TR, Sampler, Cue Loop, Slicer, Pattern and Pitch Play. Most of the functions are standard for high-end Serato DJ Pro controllers, save for two: TR lets you trigger the drum sounds from the TR-S sequencer, while Pattern lets you select step sequence patterns that you’ve saved. The DJ-808 is Serato DVS-ready, meaning you can hook up your turntables to it and spin with timecode vinyl once you’ve purchased a Serato DVS licence. It works as you’d expect it, and rounds out the extensive features list of this very capable controller. The Roland DJ-808 isn’t a gamechanger – I don’t expect a huge chunk of the DJ population to get on it – but it achieves something rare in today’s saturated DJ controller market: an elegant blend between studio production workflow and pragmatic DJ sensibilities. The TR-S is functional without being too difficult to use, but at the same time it manages to be something that’s useful for live production work as opposed to being a trivial add-on to pad an already long list of features. That said, it is a niche unit, and we suspect that it will appeal mostly to techno and house DJ/producers who want to bring a live feel to their sets without taking along an extra set of gear. Without the TR-S step sequencer, the DJ-808 still stands on its own as a piece of high-quality kit. The robust build, jogs and pads are as good as what you’d find on an equivalent Pioneer DJ or Denon DJ controller, and the myriad connectivity options let it stand toe-to-toe with other four-channel controllers. A strong start for Roland in the DJ space, and one that continues its storied legacy of servicing music producers. Highly recommended for those wanting to break new ground in their live performances without abandoning the “two decks and a mixer” paradigm of DJing. i didn’t see any mention, and wanted to confirm, does this have any of the Serato Flip Features? 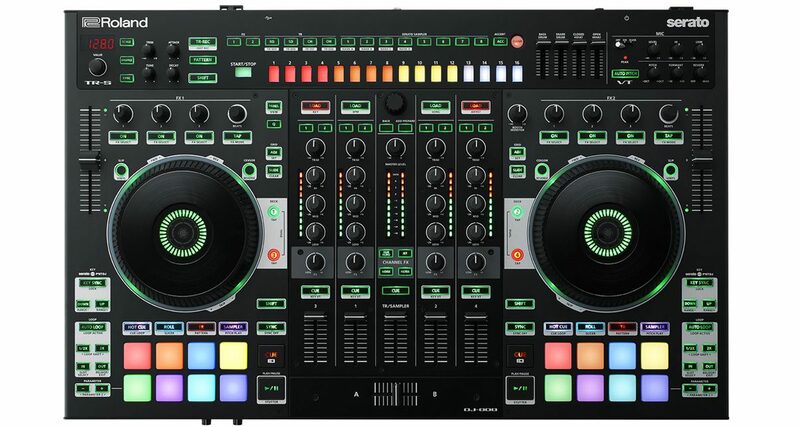 Is it possible to use this DJ-808 Controller with Traktor?